The official “taper” portion of my marathon training began yesterday. This is the 3 week period following the last real long run where you are suppose to start to taper, so you are fully recovered for the marathon. Maybe taper is the right word because you don’t make a major change. You still do weekly long runs, just not 20 miles, and you still do speed workouts. In fact I feel the speed works during this phase are the most important because for me speed is the quickest to build and the quickest to lose while base mileage takes the longest to build and the training is reatained the longest. Hence I do the last 20 miler 3 weeks before the marathon and some use a 4 week period. But I keep doing weekly speed workouts right up to a few days before the marathon. I usually alternate weeks between interval training and a fast tempo run. I did intervals on m y birthday last week (mile repeats) so today I headed out for a tempo run. Actually I first biked with Ann for 32 miles first, kind of a warmup. Then I headed out on the road in my running shoes. The first mile was kind of a warmup but still faster than my typical first mile. Then I moved the speed up to my half marathon race pace and held it there for the next 9 miles. I finished the 10 miles with an average pace of 7:39. I checked my log to discover this is the fastest pace for my 10 mile course since 2002 and then I was only only 1 second per mile faster. So I was happy with today’s run. I just finished my last long run for this marathon training. Covering that long distance and using some paths where I have measured the distances becomes a object in creativity and I have to wind back and forth over some of the same paths. I usually try to run a 18 miler, 20 miler and 21+ miler. Today I ran 21.59 and if you are not sure why that odd number, check out my other blog entry “59”. Besides 21 and 59 represents my two favorite ages to be at. Unlike my “Hot 20 Top 20” last 20 miler run, I took four water bottles today and had plenty of water, especially since the weather was nice, in the 60’s. My pace was 8:37 overall, right on the training program target of 8:38 pace, but off considerably the 8:23 pace I did a similar run last fall when training for the St. George Marathon. However back then I was focussed only on running. 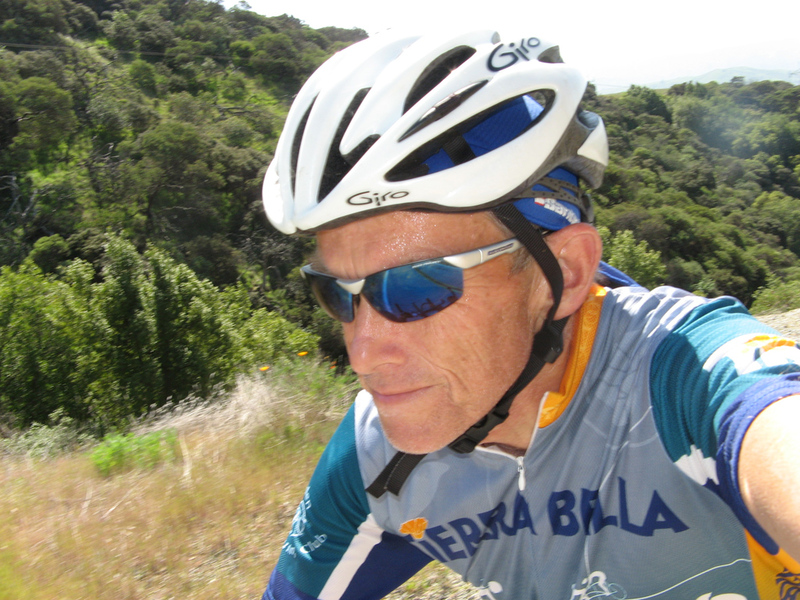 This time I am equally focussed on long distance bike training and squeezed my long run in between the long ride last Saturday (112 miles, 10,000 ft. climb) and the Solvang Double Century bike ride this Saturday. Since I want to take a rest day on Friday, I had to run yesterday to get in the running miles this week. It is all a difficult balancing act being focussed on multiple major events occurring near thee same time. Today I joined the long distance training ride (LDTR) with the bike club. 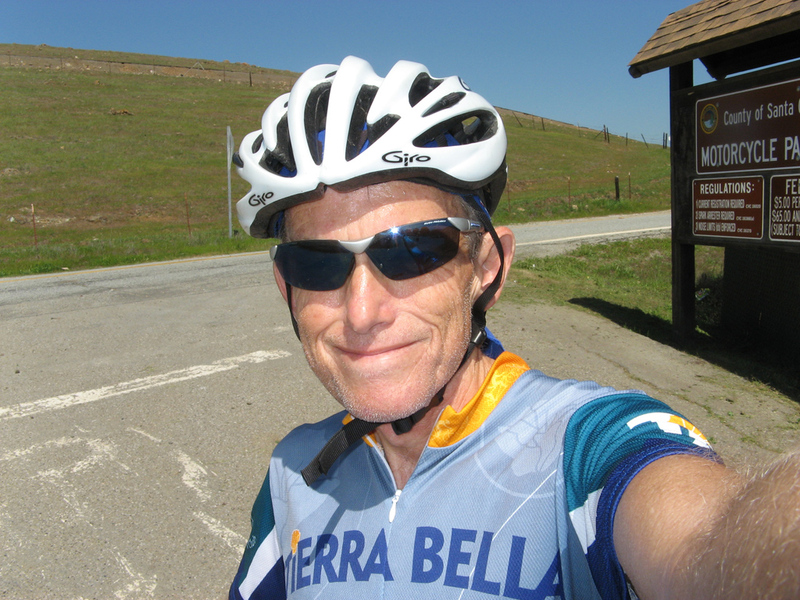 We started in Las Gatos, up Hyw 9, along Skyline, down Hyw 84 to San Gregoria, where this picture was taken. After this short stop we headed over to Hyw 1 which we took for 30 miles down to Davenport for lunch. After lunch we headed up Boon Doon, down Jamison Creek, up Hyw 236 and then the climb up China Grade. I was a bit worried because I had brought my new bike and this was a tough hill, but as I have been finding it was no that difficult climbing with just the double chain ring. Today is the day of 59. I got out of bed precisely at 6:59 to start the day. No need to shave since no one to kiss. When I got on the scales to weigh myself I was glad it not 159. I went to my computer and opened my email to find 59 emails including one from Ann (who is up in Utah), with a cute and clever poem she had written. At precisely 8:59 I started my speed workout. After a one mile warmup I did mile repeats, at at a 6:59 pace (because I can’t do 5:59), 3 full mile repeats and one a fourth for 0.9 mile, with easy jogs in between for a total of 5.9miles. I then ran one more mile to cool down. At precisely 11:59 I started on my bike ride, from home up to Metcalf, fighting a strong headwind all the way up. I was trying to keep the pace down but on Uvas I saw a couple of the Specialized riders who I just knew I could pass, so I did. They must be new employees, out of shape. I had thought about climbing Metcalf 5.9 times but when I got to the top I forgot why I was there and turned around. When I finished the ride back home, I had gone 59 miles and averaged 15.9 mph. Oh yea, I climbed Metcalf in 15:59, of course. I took some of these photos while riding, including the one of my cyclometer. Click to enlarge. It was a fun b-day but now what will I do when I am 80, bike 80 miles at 18.0 mph? What have I started! One of the hills we climb in the club is called Rolling Hills. It is not that long of a climb, but it is the steepest grade of the 99 hills we do. I use to establish my maximum heart rate each year by going up this hill because the steepest section was so difficult it took all I had to keep going. Even then I had to stand and lean forward to keep the front wheel from coming off the ground. I think a year ago my heart rate went up to 182. So I was hesitant today to take my new bike up the hill, because it has only a double chain ring but what the heck, why not give it at try. The club ride first rode up Henry Coe, which is a long climb, then after decending we headed over to Rolling Hills. I had no problem making it up the hill and was surprised that my heart rate never got above 170. So that means the higher gearing of my new bike is more than offset by my conditioning and lower total weight. Here is a graph that shows the hill profile. The shaded portion is Rolling Hills and the red line is Bohman. 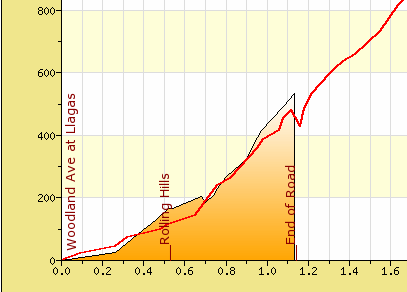 Overall Bohman is a tougher climb because it goes on much longer, but you can see the grade on Rolling Hills is steeper. I think my last post was about being down, but now out. Well I got my head back straight now with some good miles on the bike. Yesterday I did Metcalf Mauler after running 8 miles in the morning. Today I got in some real good miles, the weather was very nice once the afternoon hit. Tomorrow I am probably going to bike again because the weather is suppose to be even better, but I do need to run another 10 miles, somehow. Maybe on Friday I will take a day off the bike and do a speed workout running. I am sure by the end of this month I should be able to write about the Most Miles in March in My Mindless Memory so check back on April 1st for a Aprils fools joke. I am finding out that training for both a major running and cycling event at the same time is difficult. My training is essentially what I would be doing for an Iron Man triathlon, except I am not swimming. But I am training for both the biking distance (112 mi) and running distance (26.2 mi) of an Iron Man and I think I could do both back to back next month if I cut back on the pace. Hum … maybe I could do a Iron Man, if only I could swim. Visit my other website at www.swim2bike2run.net. 58.994382 and counting (so I feel like I am racing against the clock, the clock of father time). I am not sure if it was just finishing my tax return or reviewing my marathon training program, but I feel a bit down. For the St. George Marathon, the same week of training, I ran a 18 mile run at a 8:08 pace. Today I did 16 miles and only could manage a 8:48 pace. That is a huge difference. I just don’t seem to have the same speed and I guess that means my marathon time is not going to be as fast as last October. It might be the effect of dual training for cycling at the same time and just not having enough rest in the legs. The left leg still smarts from the fall this morning. I think all I need is some good sleep (it is now 1 am) and a good bike ride tomorrow to get my head back straight. 58.98904 and counting! I did my long run today, a total of a sweet 16 miles. However his time I got kissed by the hard ground when I took a tumble after mile 3. I had to shake myself off and get back into the grove, but I never got back to the pace I was hoping to run. I ended the run at 8:48 pace. It is interesting that this is exactly the same pace I ran 20 miles last Monday. On the run backwards, I saw what I had tripped on, one of those cement utilities boxes that was bout 2 inches above the ground but covered by the grass. I am not sure if it was the fall, the day I took off yesterday, or the 140 miles of hard cycling only 40 hours earlier, but the run today was not what I would call sweet. But I finished it and I guess that is what counts for my marathon training for Boston. Now I am going to take a shower and head to Costco to get a hot dog. After coming off last week with what I called the most miles in my memory, I decided to finally take a full recovery day. Although I felt energized at the end of yesterday’s 139 mile hammer-fest bike ride, this morning I was real tired and knew I needed to take a day off. I suppose it is the first time in over a month that I have not either ran, biked or at least hiked, and I do not like it much! I am looking forward for tomorrow’s 16 mile training run. Still part of training is recovery.